Do you want to completely erase a Mac and reinstall its operating system? Perhaps you are about to give away this Mac. Or, perhaps your Mac is acting up and you want to start with a clean slate. Here are instructions on how you can erase the hard drive and reinstall OS X, recently renamed macOS. OS X 10.7 and newer includes a feature called the Recovery Partition. This is a normally invisible part of the Mac’s hard drive. The Mac can start up from the Recovery Partition, and it can be used to erase the hard drive and then reinstall OS X onto that hard drive. Here are the steps to erase your Mac’s hard drive and then reinstall the Mac operating system onto it. Turn on the Mac and immediately press and hold down both the Command key and the R key. This instructs the computer to startup from the Recovery Partition. Once you see the Apple logo appear in the middle of the screen you can release the Command and R keys. Your Mac is now starting up in Recovery Mode. Click on Disk Utility and then click the Continue button. Click on your Mac’s internal hard drive. It’ll be listed in the left-hand side of the Disk Utility window. Typically the hard drive is named Macintosh HD but yours could have a different name. Click the Erase button and follow the prompts to erase the hard drive. You will be warned that everything will be removed from the hard drive and that this is permanent. When you have finished erasing the hard drive, click on the Disk Utility menu and select Quit Disk Utility. 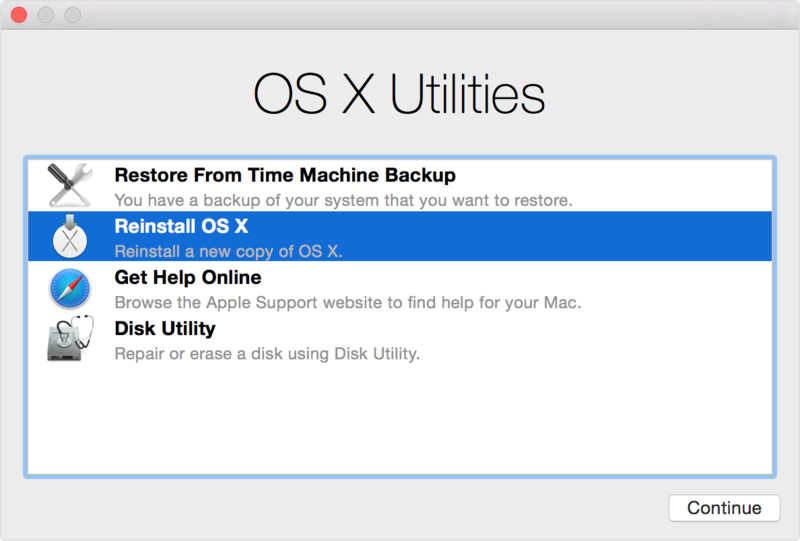 You’ll be returned to the main OS X Utilities window. Click on Reinstall OS X. If your Mac is running macOS Sierra or newer then click on Reinstall macOS. When the installation has finished the Mac should automatically restart itself and take you to its Setup Wizard which will ask you a series of questions to guide you through initial setup of your Mac. Read more about erase, macOS, mode, operating system, OS X, partition, recovery, reinstall.